In one way, I think my wife usually dreads the autumn, because that’s when I start doing things with winter squash. For the most part, she’s not into them. I think it has something to do with the way they sort of stick to your teeth, and their tendency to be sweet like sweet potatoes (also not on her list of favorites). So I was pretty surprised by her reaction to roasted and sliced delicata squash. 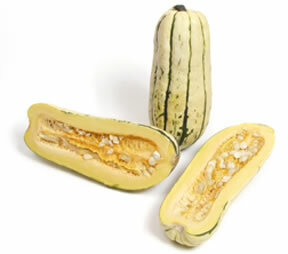 The delicata squash is ovoid in shape, with slight ribs running along its length. Their default color seems to be a light, creamy yellow, but that’s streaked with orange and green most times. They’re relatively easy to peel compared to most other winter squash, as the skin is smooth and mostly unblemished. I use a Y-peeler for the main body, pulling it towards me as I go, and a normal peeler for the rounded ends, which I trim off mostly anyway. I cut it in half, and core out the seeds and guts with a spoon. Then I slice the meat in quarter inch slices, toss them in olive oil and salt, and spread them on a foil lined baking sheet. 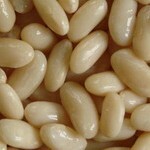 I cook them in a hot oven, 425, for about an hour, tossing them halfway through. The result is almost like french-fries, but with more fiber. She especially likes the dark and crispy caramelized parts. I bet if your kids don’t like to eat vegetables, they’ll dig these, too. I tossed together some green bean casserole last night for dinner. Just some frozen haricot verts, parboiled for 5 minutes, and some pre-made alfredo cheese sauce. I was thinking about topping the whole thing with Parmesan and panko bread crumbs, but then I remembered Alton Brown’s recipe for green bean casserole, where he eschewed all premade badness (the canned crispy onions and the cream of mushroom soup) in favor of homemade. He topped them with fresh made onion crisps. As leftovers, my wife exclaims that while the green beans are “good,” the onions are “fab! Just like onion rings!” So I guess I’ll be making them more often. The recipe isn’t that hard, though it’s a little heat intensive for a hot summer day. Preheat the oven to 475°. Slice the onions as thin as possible. (I use a slicing gizmo.) Separate into rings, and put in a large bowl. Add flour and bread crumbs and salt. Toss so that all the rings are relatively well coated. Spread on a sheet pan sprayed with cooking spray, and cook in the middle of the hot oven for 30 minutes, tossing every 10. A tasty recipe to use up all the squash for your garden. In a small saucepan, bring the vinegar to a boil, and reduce by half. In large frying pan, sauté the scallions in a little hot oil. Add the zucchini, and allow it to brown on both sides. Add the reduced vinegar and toss to coat each slice. Remove from heat, and add chopped mint leaves. Salt and pepper to taste. Serve warm or at room temperature. 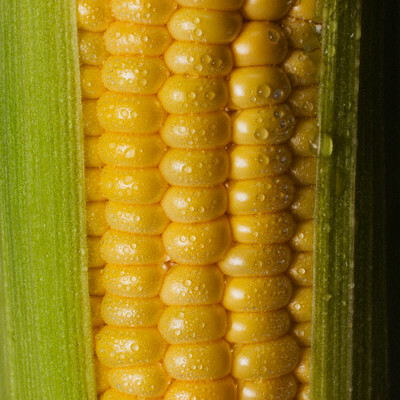 As far as I’m concerned, there are only two ways to make corn on the cob … the good way, and the better way. The good way has you boiling a pot of water with a handful of salt and a handful of sugar, and once the water is at a full boil, you put in the shucked corn, let it boil for 5 minutes, and then turn off the heat, and let it steep for another 7 to 10. In either case, slather it with butter and kosher salt. I’ve read suggestions that you can cook corn in the microwave, wrapping the corn in plastic wrap, and steaming it in the husk. I’ve tried it with very mixed results, so I generally stick to the two methods above.